After fixed braces are removed and the teeth are straight, retainers will be fitted. These are essential to maintain the teeth in their new positions and patients should consider wearing these appliances indefinitely to maintain stability of their orthodontic result. There are two types of retainers, removable and fixed. Your orthodontist will discuss with you which of these retainers will be suitable for you. The patient is usually required to wear removable retainers initially full time for a period of 3-6 months to be followed by night time wear indefinitely. 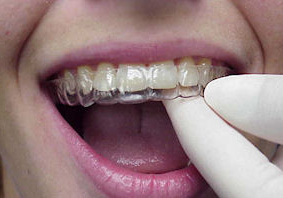 Teeth may revert back to their pre-treatment position if the patient fails to wear retainers as instructed. How long should one wear retainers? Retention is a very important part of treatment, even though we do not need to check up on the teeth as often as when one is wearing braces. We typically advise patients to wear their retainers for 3 months full-time, then evenings and nights thereafter. Although we will supervise our patients' retainer wear for one year, retention should be regarded as indefinite - we would recommend continuing wear of retainers on an occasional night time basis for as long as you want your teeth to remain straight. The reason for this is because research has shown that teeth will can move and become misaligned, even after correction with orthodontic treatment. Studies have shown that at 5,10 or even 20 years after treatment, there is a tendency for the teeth, especially the lower front teeth, to move. Why this occurs is unknown: it is a common problem and has often been blamed on erupting wisdom teeth, but some people without wisdom teeth also have lower front teeth crowding. If you continue to wear your retainers on a long-term basis at night, this will prevent the teeth moving. It would be disappointing for everyone concerned if you did not wear your retainers as advised and the teeth moved - this is called relapse. They would not go back all the way to where they were before treatment but they might move enough to spoil a nice result.